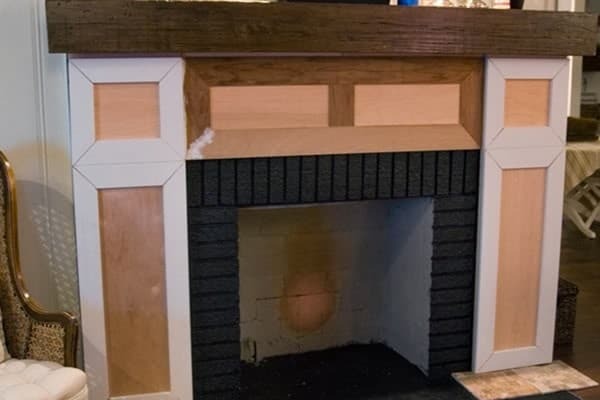 See this amazing fireplace mantel makeover before and after! 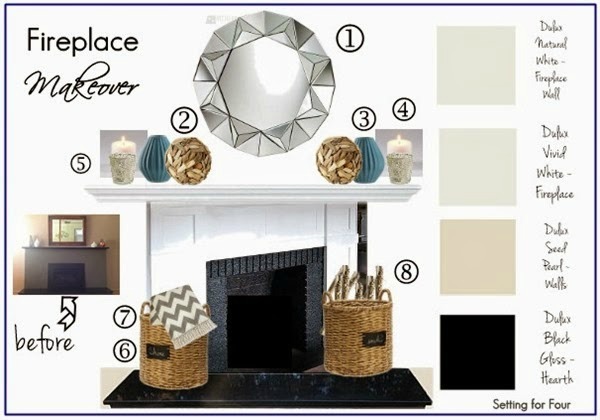 See the advice and tips I give a blog reader looking for decor advice for her fireplace! 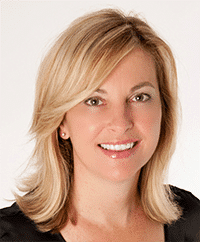 I love problem solving and helping others beautify their home for themselves and their family! I recently received an email from a reader asking for interior design help with her fireplace. After sending me a photo of her fireplace and a list of her concerns I came up with this design moodboard! 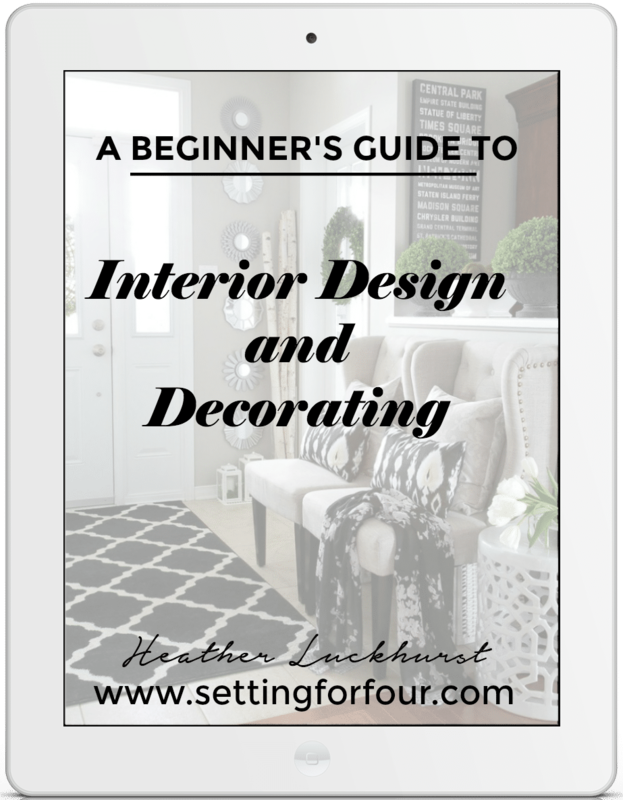 I’ve included lots of tips, suggestions explaining how this plan will create a beautiful focal point in her room! – Fireplace feature wall color is Dulux Net Worker. – Fireplace is a dark grey cement material. – Mantel Hearth is black marble. 1. Add architectural detail to the fireplace to give it more presence and interest. 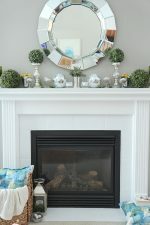 See the Lettered Cottage’s mantel makeover to see how you can add moldings and DIY this yourself! 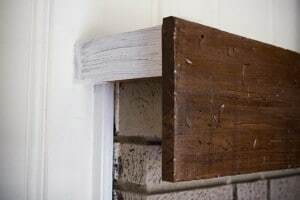 Add a thicker mantel as they did as well. A contractor can also do this easily. 2. 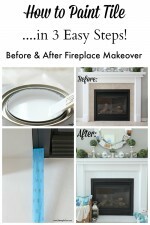 Paint the fireplace piece, that’s below the hearth, the black color that you painted your mantel with. This will make the thin piece of black marble hearth appear thicker and give it more visual weight and oomph! Natural White is a popular Dulux color and it will look beautiful against your white mantle and coordinate with your other wall color and well as brighten the whole room. Always paint a small area of your wall first to make sure the color will work with the lighting in your room.  If this color doesn’t work in your space check out the Dulux Trend Colors for 2014. 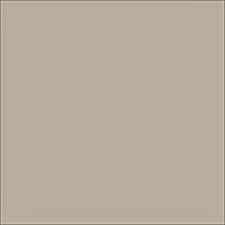 I don’t know the colors of your furniture so I would suggest you stick with a neutral white, taupe or grey color for the feature wall. Also from a design point of view too much contrast between a feature wall color and the color of your other walls, Seed Pearl, will distract from the fireplace and mirror which should be the focal point, not the wall itself. Ask your Dulux representative what wall color they might recommend to coordinate with Seed Pearl, since they are trained on which of their colors combine well together! 2. Paint the fireplace and mantel an interior semigloss Dulux Vivid White to coordinate with your baseboard trim paint to give it a cohesive look. 3. Add a basket to each side of the fireplace to give the hearth more weight and create storage for throws or magazines. 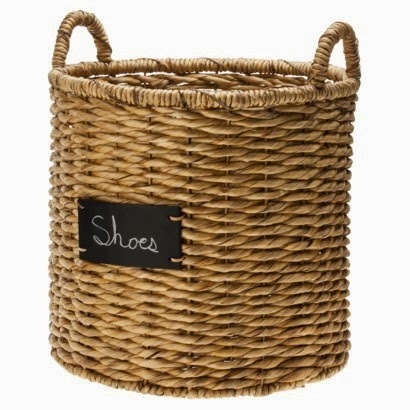 You can also fill them with birch branches for a more rustic look and a touch of nature. Add black chalkboard tags to tie in the black color of the marble hearth. 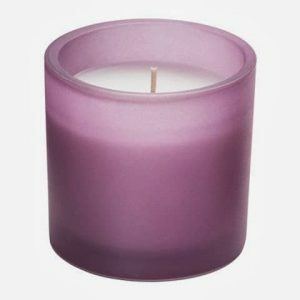 Adding more of the same colors that already exist in the room will give your room harmony and flow. These sea grass baskets will add a nice color and texture to the fireplace and the room itself. Alternatively, add a silver metal lantern to the hearth, on each side of the fireplace, adding a candle to each. 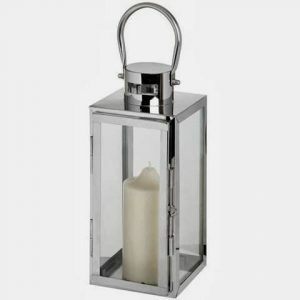 This will add a beautiful glow of candlelight in addition to the flickering firelight from the fireplace. 4. Replace your mirror with a round one – this will provide contrast of shapes (the fireplace is rectangular and the mirror is round) which creates interest. Hang the mirror 8 –12 inches from the top of the mantel. 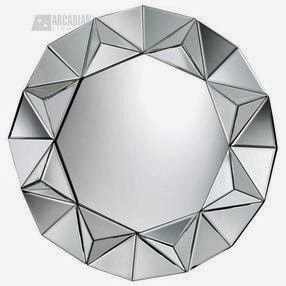 Buy a mirror with a metallic edge or a mirror with a faceted edge to help bounce light within the room. 5. 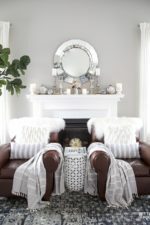 Decorate the mantel: You can place the accessories in a symmetrical (balanced) or asymmetrical (unbalanced) way depending on your personal preference. I hope you like this design moodboard and my makeover tips! Good luck with your fireplace makeover and please send me your ‘after’ photos! That’s wonderful and I can’t wait to see some photos if she sends you some. We don’t have a fireplace but when I see these pictures I wish we did!!! Thanks Jule for your lovely comments! I’m so excited for her too!! Love it Heather! The new colours will freshen up the whole room. The first thing I did when I moved in was to paint the ugly brick around my fireplace. It turned out great, and it’s actually my favourite thing in the room now. Love your styling, too! Gorgeous Heather- I absolutely love your suggestions. That thick molding around the fireplace with the chunkier mantel is perfect. I love your mantel designs too. 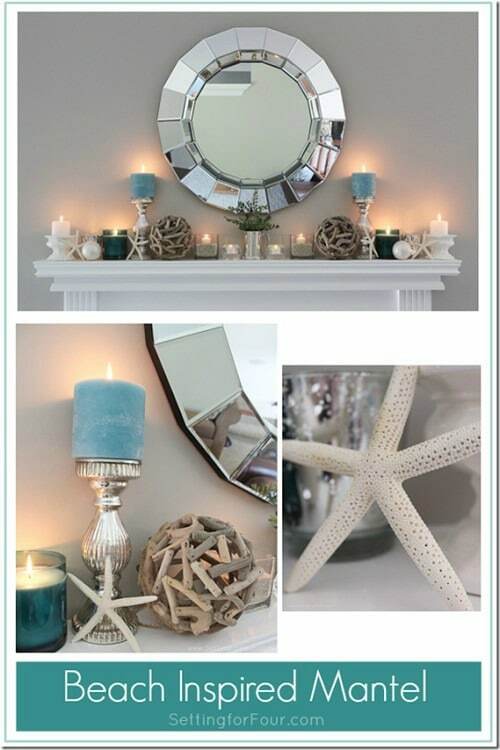 I just recently did a beachy/blue winter mantel and love the feel of it (I like to use beachy touches all year round because of our lakeside location). If I were Raeleen I would definitely be inspired!! What gorgeous ideas you have came up with! The examples you’ve shared are sure to make the client fall in love with the mood you’ve created! It is amazing what some creative refacing can do for an entire room. Love the palette, Heather! Love that you’ve suggested some sparkle and texture- going to be fantastic! I really like where you went with this, Heather! I love the lighter, airier feeling, and painting out the base beneath the hearth in black was genius!! I like your suggestions too, that would look beautiful put together! I love the suggestions. Especially about adding trim to the mantle. Just that alone will make it look like a whole new fireplace. 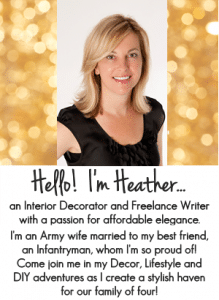 Great ideas Heather! Love the mirror you picked! Pretty! I love that mirror!! Your spring mantel is so cheery; I can’t wait for the next two months to bite the dust.